One in 2000 people worldwide may have Keratoconus, a condition which results in your cornea thinning and bulging, becoming oddly shaped. Not only does it cause your vision to become impaired, but those with KC also complain of double vision, halos, ghosting, dry eyes and headaches, Keratoconus is VERY hard to treat effectively. That’s why the world is coming together to raise awareness for World Keratoconus Day on November 10. You can also visit the NKF website at www.NKFC.org for more information about Keratoconus and World Keratoconus Day. Do You THINK You Have Keratoconus? Have you ever wondered if you have Keratoconus? If not, maybe you’ve been diagnosed with astigmatism and are still having a hard time correcting your vision. Maybe your vision changes so frequently, you rarely remain with the same prescription for more than a few months. Or maybe your Optometrist has told you that your eyes are just “hard to fit” with contact lenses. All of those are signs that you might have Keratoconus. And if it’s not you, maybe someone you know has those symptoms. If so, it’s time to get screened for Keratoconus. The best way to do that is with an eye exam with a qualified Keratoconus Expert like Dr. Barry Leonard. If the exam reveals that you do have Keratoconus, his advanced treatment methods can help you finally see clearly with Keratoconus. Do You KNOW You Have Keratoconus? If you’ve already been diagnosed with Keratoconus, and have just not been able to treat your condition effectively, make an appointment to see Dr. Barry Leonard today. Dr. Leonard has specialized equipment that can not only diagnose your Keratoconus, but help to build a prescription for specialty contact lenses that can finally help you treat your Keratoconus and see clearly and without discomfort. 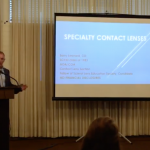 Dr. Leonard not only is a Keratoconus Specialist but also is a Keratoconus patient. He was diagnosed in the 1980’s when Keratoconus was difficult to treat. These days, there are advanced treatment methods, including the use of Scleral Lenses, that can finally make life “normal again” for someone with Keratoconus. Dr. Leonard has written an Ebook all about Keratoconus, what it is, what causes it, and how to treat it. You can get your own copy of “Seeing Clearly With Keratoconus” by filling out the form on this page. On World Keratoconus Day, and every day, the ebook is Free. Thank you for helping to spread the word about World Keratoconus Day. If you or someone you love has Keratoconus, write a post about Keratoconus on your own social media. Or share the resources on this website. Then make sure that you make an appointment with nationally known Keratoconus doctor Barry Leonard to be diagnosed and treated. You can make an appointment online or by calling 818-891-6711.